Lymphocytes are important in health and disease, and this article will begin to explore how. But first, here is a list of 10 must-know lymphocyte facts, to get you started. Lymphocytes are a kind of white blood cell (WBC). Lymphocytes are cells of the immune system and help fight infection. Lymphocytes live in lymph nodes, but also in the blood stream and all over the body. Lymphocytes come in two main types: B-cells and T-cells. Abnormal numbers of lymphocytes in the blood may be temporary or long-term. Too many lymphocytes in the blood is called lymphocytosis. Too few lymphocytes in the blood is called lymphopenia. Lymphocytes may be malignantly transformed into chronic lymphocytic leukemia, acute lymphoblastic leukemia, and certain types of lymphoma. Lymphocytes originate from stem cells in the bone marrow. T-lymphocytes mature, or grow up, in the thymus, an organ in the neck area. Where in the Body Are Lymphocytes Found? RBCs are the main source of ‘traffic ­on the highway’, so to speak—that is, RBCs are just like your cars, SUVs, pickups, and minivans on any road trip. On any road trip, however, you’re also sure to see some non-passenger vehicles—e.g., 18-wheelers, construction vehicles, a lone U-Haul, or maybe a state trooper or two. These trucks and non-passenger vehicles are kind of like your WBCs in circulation: They certainly don’t make up the bulk of the traffic, but you’re never really surprised to see one. So, lymphocytes, a type of WBC, fall into this “not common but not rare” sort of category in the blood stream. Note that lymphocytes are just one of the many kinds of WBCs, and also that lymphocytes, themselves, come in different types, just like you might have both state troopers and local police, all on the same stretch of highway. They are both police cars, but there are important differences between them. If you were ever to venture off the highway and accidentally get in line at a weigh station, you’d find yourself among 18-wheelers and maybe a few police cars. That’s sort of what it might be like to enter your body’s lymph system as a red blood cell: you are not supposed to be there. The lymph system is a system of channels—the lymph vessels—in which WBCs such as your lymphocytes are the most common cell types. These channels are never very far from the main roads and arteries that are filled with RBCs, but they are their own distinct networks. RBCs aren’t normally supposed to be in these channels, and if they are, it may indicate some traumatic injury or other abnormality. Lymph nodes are small, bean shaped structures that sometimes swell—those bumps on your neck during an upper respiratory infection, for instance. Lymph nodes might be considered the “truck stops of the lymphatic system.” These ‘truck stops’ are strategically situated out along the network of lymph highways, fairly evenly spaced, whereby the lymphocytes can check in and stay a while, sampling the local atmosphere. RBCs might be nearby, since even something as small as a lymph node needs a blood supply, but it’s the cells of the lymph system, immune cells, that truly enter and reside in the lymph node, and the white blood cells, in particular. The lymph system and the circulatory system are separate; only some of the WBCs such as lymphocytes and macrophages are able to ‘walk through the walls’ to go back and forth between the lymphatic system and the circulatory system. These WBCs can even leave both the circulatory and lymph systems, to prowl in various organs, as part of their regular duties or as the need may arise. To summarize, lymphocytes are one of the types of WBC that can be found in your veins and arteries, in the body’s circulation. But lymphocytes can also be found elsewhere in the body—in the lymph nodes and lymph channels of your body’s lymphatic system. Additionally, they can also be found scattered all over the body in the spleen, tonsils, intestines, and in the lining of the airways, for instance. Here the lymphocytes represent what is referred to as “lymphoid tissue.” Some of the most commonly known lymphoid tissue is in the intestines, in a stretch of territory called Peyer’s Patches. The lymphocytes are more highly organized in these locations, in structures called follicles. There, lymphocytes form an important part of the immune system by monitoring bacteria that live in the gut, preventing the growth of bad bacteria in the intestines. One of the most interesting places to find lymphocytes in the body is an organ known as the spleen. In some respects, the spleen is like one giant lymph node. To reduce the spleen to its role in the immune system would be unfair however, as this organ does many things simultaneously, including storing much of your supply of platelets that help your blood to clot, as well as retiring old and tattered RBCs from circulation. What Do Lymphocytes Look Like? Most people in the clinical setting get their first look at a real lymphocyte by peering into the microscope in a lab somewhere. When a drop of blood is taken and smeared on a slide and treated with the right stains, you can see lymphocytes every now and then, among all the red blood cells. Lymphocytes are fewer in number, or less common, than the RBCs. Lymphocytes are not as big as blood monocytes, another WBC type. Unlike the red blood cells, which lack a nucleus in human beings, the lymphocytes look like they are almost entirely comprised of the nucleus—like a fried egg with very little white and almost-all yolk. With the proper stain, however, the yolk or nucleus of the lymphocyte is usually dark purple, while the egg white or cytoplasm is lighter pink. Like all blood cells, both red and white, lymphocytes begin their life’s journey in the bone marrow. Once a person is born, the bone marrow becomes like a factory for producing new blood cells. Lymphocytes come in two main types, T-cells and B-cells. Both are lymphocytes, but they have different jobs. T-lymphocytes, it turns out, have somewhat of a unique story when it comes to their origins—a story that reflects their very complicated jobs as grown-up cells. The ‘T’ in T-cells actually stands for thymus, whereas the ‘B’ in B-cells refers to the bone marrow. All of your white blood cells are made in the bone marrow, but only a special subset of these blood-forming cells migrates from bone marrow to thymus, where they ‘train’ to become T-lymphocytes. Thymus cells provide the right environment, with cell receptors and chemical signals, to rear the would-be T-cells properly. The thymus makes sure these cells grow up to have the right ‘equipment’ or markers on the outside of the cell. There is also a process of selection and weeding out. The survivors differentiate into specialized (CD8+ or CD4+) T-lymphocytes and spend about 10 days in a certain part of the thymus, where they learn to tell the difference between ‘self’ markers and foreign invaders’ markers. After this intricate process, the T-cells can leave the thymus and do their various jobs in the immune system. There are actually many differences between B-cells and T-cells, even though they are both lymphocytes. B-cells and T-cells are associated with different “territories” of the immune system. One part of the immune system—the more B-cell dominant territory—is focused on making antibodies that can bind to foreign invaders and lead to their destruction. The other part of the immune system—the more T-cell dominant territory—is focused on recognizing the invaders and then directly killing them, through a very specific recognition sequence that leads to cell-to-cell battle. These two different turfs or territories are described by specific terms. The artillery, or the antibody-producing side, is known as humoral immunity. The infantry, or the cell-to-cell battle side, is known as cell-mediated immunity. B-cells are the cells that come to mind when thinking about antibodies, or humoral immunity, and T-cells are the cells that come to mind when thinking about cell-to-cell combat, cytotoxicity, or so-called cell-mediated immunity. In reality, there is often cooperation between B-cells and T-cells, just as there is coordination between those who fire the mortars and the infantry. B-cells mature in the bone marrow and move to the lymph nodes. B-cells become plasma cells or memory cells when foreign antigens activate them; most B-cells become antibody-producing plasma cells; only some remain as memory cells. Memory B-cells help ensure that if the enemy is encountered again in the future, the mortars are prepared. Plasma cells can be found in lymph nodes and elsewhere in the body, where they work to produce large volumes of antibodies. Once antibodies are released into the blood and lymph, these antibody molecules bind to the target antigen to begin the process of neutralizing or destroying the foreign agent. Cytotoxic T cells find and directly attack foreigners such as bacteria, viruses, and cancer cells. Helper T cells recruit other immune cells and organize an immune response. 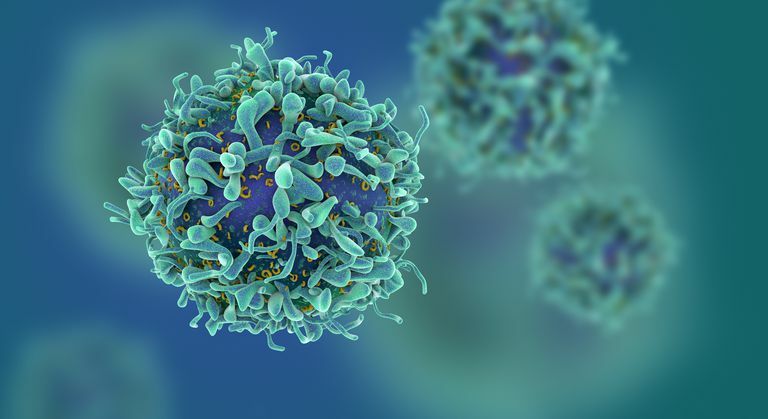 Regulatory T cells are thought to suppress the immune system so that it doesn't overreact (as it does in autoimmune diseases), however central aspects of the biology of these cells remain shrouded in mystery and continue to be hotly debated. Natural killer T (NKT) cells are not the same thing as natural killer cells, but they do have similarities. NKT cells are cytotoxic T cells that need to be pre-activated and differentiate to do their work. Natural killer (NK) cells and NKT cells are subsets of lymphocytes that share common ground. Both can rapidly respond to the presence of tumor cells and participate in anti-tumor immune responses. Memory T cells remember markers on the surface of bacteria, viruses, or cancer cells that they have seen before. Now that you are more familiar with lymphocytes, the different types, their various jobs, and respective stomping grounds, let’s see how all of this relates to lymphoma. Lymphoma occurs when lymphocytes grow and multiply uncontrollably. The cancer occurs at some point in the development of various types of lymphocytes. The cancerous lymphocytes can travel to many parts of the body, including the lymph nodes, spleen, bone marrow, blood, or other organs, and they can even form a mass altogether in one spot, called a tumor. Because healthy lymphocytes can typically move about and be present at different sites in the body, the idea of metastasis (which applies in many other cancer types) does not really work well in lymphoma. Lymphoma cells may be found in a lymph node and maybe in the spleen, as well. You wouldn’t really call it metastasis, since the spleen is an organ in which healthy lymphocytes can normally be found. So in the case of lymphoma, there is a different language that has developed to describe the extent of spread of disease. Most lymphomas begin in the lymph nodes, but lymphomas may arise virtually anywhere in the body. When a lymphoma begins outside of a lymph node, it is called primary extranodal disease. When a lymphoma begins in a lymph node but then grows and spreads to involve other structures, it is called extranodal involvement or secondary extranodal disease. Unlike the spread of, say, prostate cancer as it metastasizes into other organs such as the bone, the spread of lymphoma to other structures in the lymph system does not necessarily have the same importance to a person’s prognosis. The two main categories of lymphoma, Hodgkin and non-Hodgkin lymphoma, have more to do with the history of their discovery than anything that is particular to lymphocytes. That said, the type of lymphoma that Thomas Hodgkin discovered happened to be a lymphoma that developed in cells of the B-lymphocyte side of the family. With non-Hodgkin lymphomas, you can have B-cell lymphomas or T-cell lymphomas. If the B-cell lymphoma is not the Hodgkin’s type, then it is known as a B-cell non-Hodgkin lymphoma, or B-NHL. The most common subtypes of NHL both happen to be lymphomas of the B lymphocytes. T-cell lymphomas account for about 15 percent of all NHLs in the United States. Just as with B-cell lymphomas, there are many different kinds of B-cell lymphomas. Everybody has both red blood cells (RBCs) and white blood cells (WBCs) in their circulation. The red ones give the blood its color and tend to receive a lot more attention during introductory science lessons. As the RBC, or erythrocyte, makes its way to the oxygen-needy tissues in the body, it gives up its oxygen and picks up carbon dioxide, then travels back to the heart and lungs for gas exchange and to get more oxygen. In its travels, the RBC is apt to encounter a variety of different WBCs along the way, and the lymphocyte is one of them. NCCN Clinical Practice Guidelines in Oncology. Non-Hodgkin's lymphomas. National Comprehensive Cancer Network. Available at http://www.nccn.org/professionals/physician_gls/pdf/nhl.pdf. SEER Cancer Statistics Factsheets: Non-Hodgkin Lymphoma. National Cancer Institute: Surveillance, Epidemiology, and End Results Program. Available at http://seer.cancer.gov/statfacts/html/nhl.html. Stein H, Bob R. Is Hodgkin lymphoma just another B-cell lymphoma? Curr Hematol Malig Rep. 2009 Jul;4(3):125-8.